Contact us to fill out a short form to tell us about yourself and the due date for your invitation design. We will get back to you ASAP (almost always same day if it’s Monday – Friday) to confirm our availability and get more details about your project. Ready to work with us? Then you can Schedule an Appointment on our online appointment calendar! 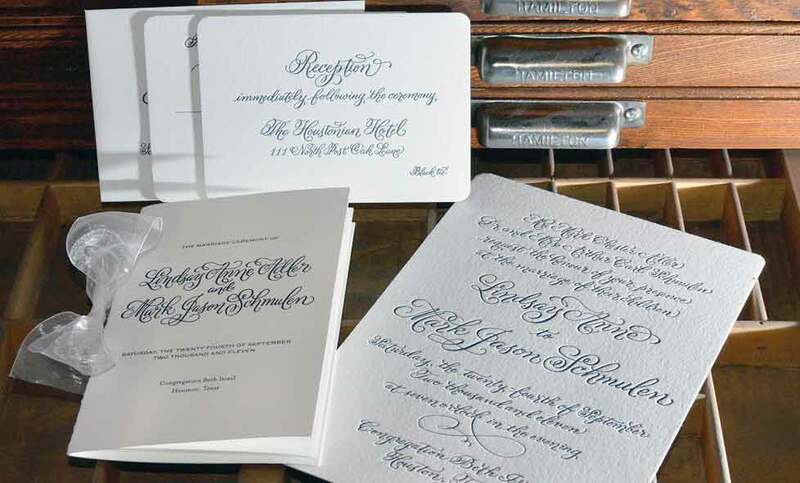 Custom invitation design allows you to be part of the design process as you work with your calligrapher to select the style, layout, and embellishments to reflect the theme and personality of your big event. You’ll have the freedom to create a look that would be difficult to achieve using ordinary computer fonts. The names of the bride and groom can be intertwined… flourishes can be subtle or dramatic… whatever fits your style! Need more ideas? Visit our online portfolio to view custom styles we have designed for other clients. 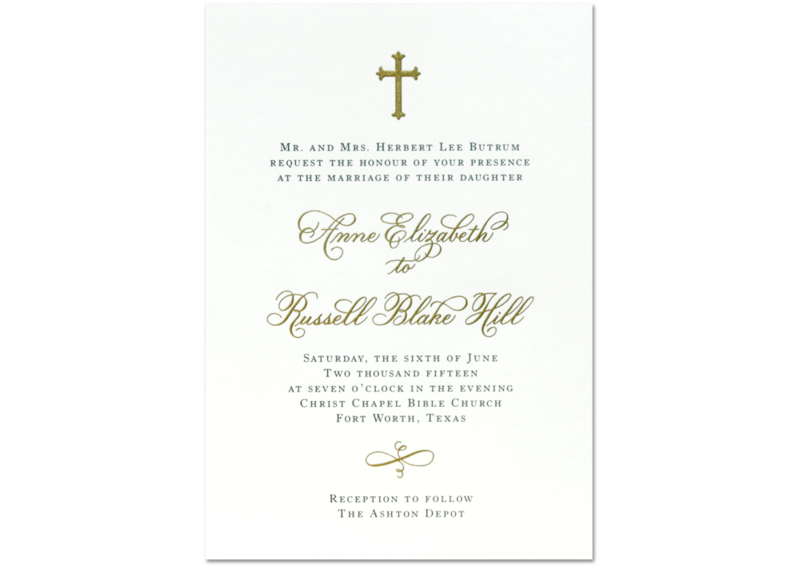 For a simple, elegant look, pair the bride and groom’s name designed in hand calligraphy with a pretty block font for your invitation. 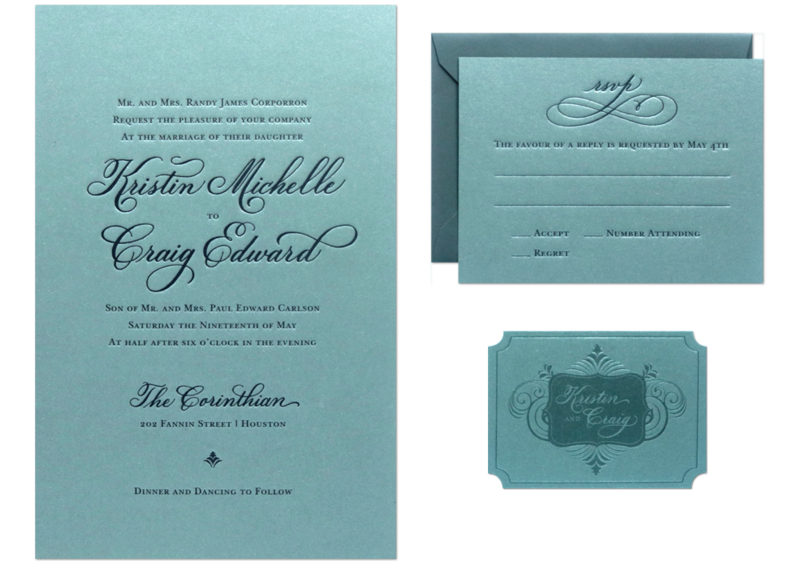 This is less expensive than designing the entire invitation in hand calligraphy, yet still gives that hand-rendered touch. 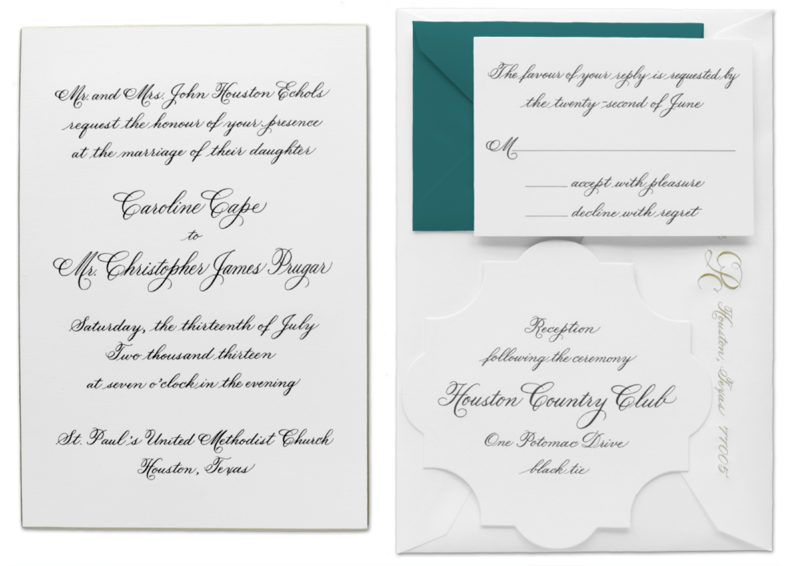 You can also add spot calligraphy throughout the invitation suite. After you provide Maureen with the dimensions of your invitation pieces and the final wording, she’ll create an eye-catching custom design for your review and approval. Expect the first draft within 5 business days after sending Maureen the information. You’ll have 2 chances to review the drafts and request minor changes prior to the completion of the final invitation design. Minor changes include changing line spacing, changing the shape of a capital letter, or making slight changes to any flourishing. Minor changes do NOT include changing the entire calligraphy style or changing the wording of the design. These types of changes will incur additional design fees. After you approve the design and pay the final balance, Maureen will email the design files to you and your favorite printer or stationer. 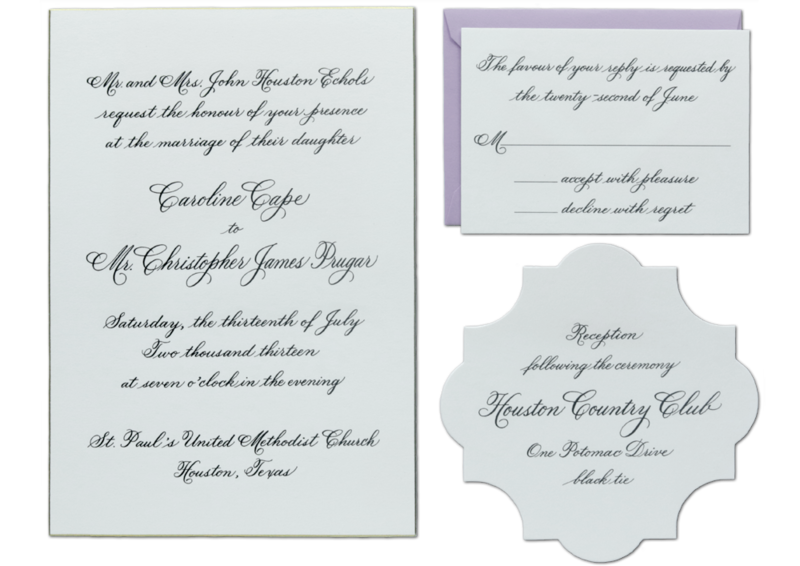 Please fill out a Request for Quote form to provide us with the design details for your invitation! If you request changes to the design, please allow up to 2 business days for the next draft. However, most minor changes can be turned around in 1 business day. The client is responsible for proofreading and ensuring that the text and layout are correct before giving final approval for PenDance to send the electronic files to the stationer or printer. Payment of the balance due is required before the design is released to the client and stationer/printer. After you receive the proof from the stationer/printer, please look over the invitation pieces carefully to ensure that the text, layout, and margins are correct before giving approval to the stationer/printer to go to print. NOTE: If there is an error in your proof and you fail to notify PenDance of the error before your invitation design is printed, you agree that PenDance is not liable in any way for the error and that you will bear the cost of additional design or printing fees that may be incurred to correct the error. Maureen, I just wanted to tell you how amazingly beautiful and stunning your work is and what an incredible job you did on our invitations! There was not a single mistake, and I just couldn’t stop looking at your artistic ability.